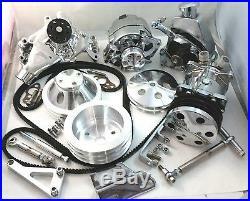 New Complete Polished Billet Front Long Water Pump Accessory Drive Kit. Please Read ALL The Notes before ordering.. 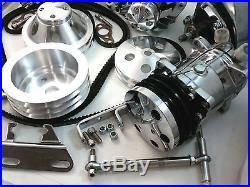 This is a co mplete front pulley bracket kit With A/C. 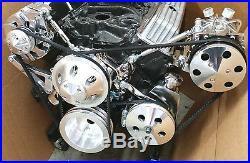 Fits All Small Block Chevy Motors From 1958 to 1995. 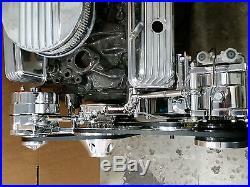 Will Work on 1996 -1999 Factory GM Iron Vortec Heads. Note: Aftermarket heads may vary. Check passenger side head dimensions. No need to shop around and try to piece together this kit. 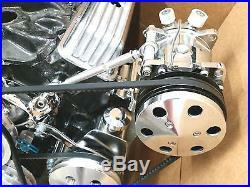 (1) Chrome High Volume Aluminum Long Water Pump. (1) Chrome Billet Alternator Bracket With Bolts. Note: Must Have Accessory holes in head for bracket to work. 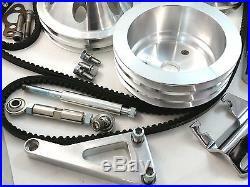 (1) Chrome A/C Bracket Kit. Note: Will Not Work with exhaust manifolds (Headers Only). 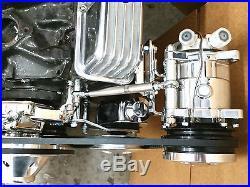 (1) Chrome 508 A/C Compressor. (1) Chrome Steel Power Steering Bracket. Note: Power steering bracket can be mounted in a High Or Low position. Very Important Note: The 2 holes next to the balancer on the engine block are used for the power steering bracket. Some blocks will need to be drilled and tapped to allow uses of the power steering bracket.. Kit will not work with front engine mounts. 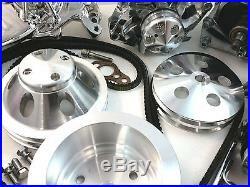 (1)2 Groove / Belt Polished Billet Aluminum Water Pump Pulley (6-9/16 Diameter). (1) 3 Groove Polished Billet Aluminum Crank Pulley (6- 9/16). 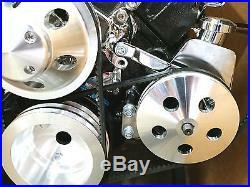 (1) 2 Groove Polished Billet Aluminum Key Way Style Power Steering Pulley. (1) Chrome 100 AMP 1 Wire GM Alternator. (1) Polished Billet Alternator Pulley & Nut Cover. (1) A/C Polished Billet Clutch Cover. (1) Polished Billet Alternator Fan Blade. Note: Alternator Pulley and fan blade pre installed on alternator. 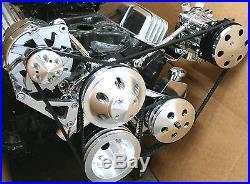 (1) Chrome GM Sa ginaw "A" Can Style Power Steering Pump. 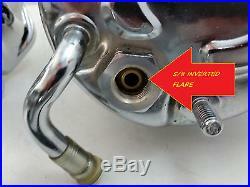 Very Important note : This Pump comes with 5/8 inverted flare inlet for the PSI Hose. If using this kit on 1975 and later applications you will need a new hose to go from a metric o-ring style to the 5/8 Inverted flare. (1) Chrome Crank Pulley Bolts & Washers. (1) Stainless Steel Water Pump Bolts. The item "SB Chevy SBC Complete LWP Aluminum Pulley Kit WithAlternator, Power Steering & A/C" is in sale since Sunday, August 14, 2016. 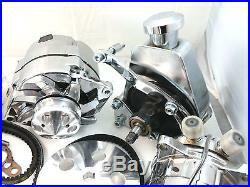 This item is in the category "eBay Motors\Parts & Accessories\Car & Truck Parts\Cooling System\Water Pumps". The seller is "elcamino9606" and is located in Chatsworth, California.